At most classic car shows, you can count on there being a good amount of Mustangs, Camaros, and Corvettes. Because of their sporty styling and powerful engines, these cars were immensely popular when new and remain popular today. The Ford Thunderbird was different, as it was designed to be a personal luxury car. When you do see one at a car show, it is usually restored to showroom new condition. For whatever reason, Thunderbirds are not commonly modified to custom cars or drag racers. 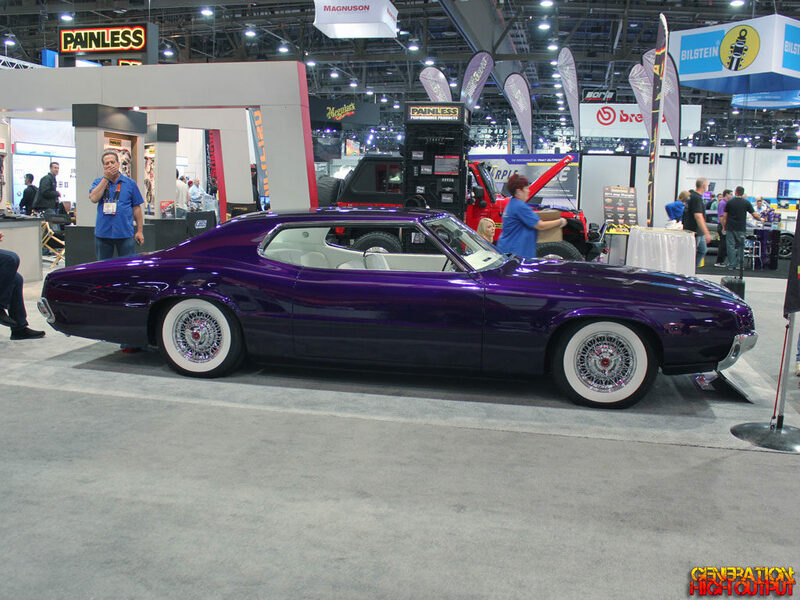 This 1970 Thunderbird custom was a standout at the 2015 SEMA Show in Las Vegas. I came across this car and stopped in for a closer look. Nicknamed “Thunderstruck,” the car was built by Eddie’s Rods and Customs in Pueblo West, Colorado. Keen eyed readers will notice that the front end is not from a 1970 car. That’s because the front end of a 1967 T-Bird with its hideaway headlights has been grafted on to the car. It’s a personal touch that some may not like, but I think it fits the car well. 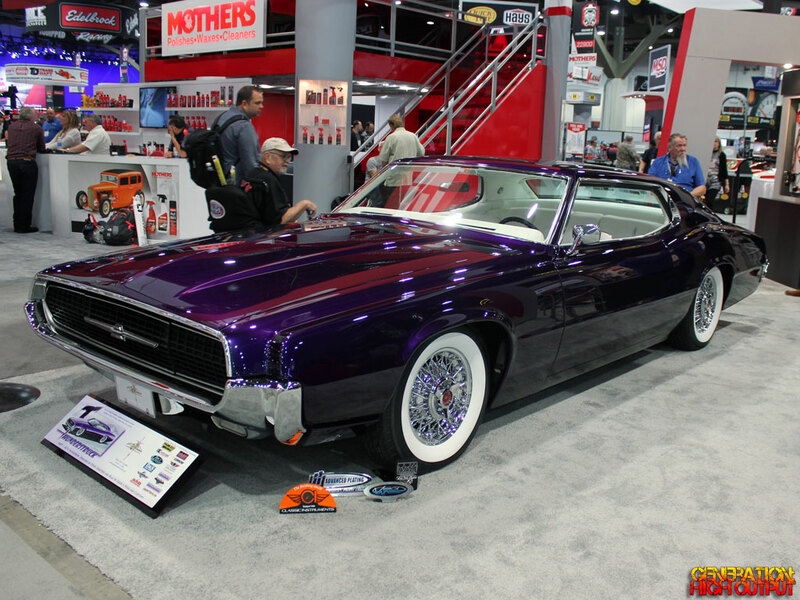 The body work on this car is outstanding, right down to the gorgeous purple paint. The dark color is contrasted nicely by the whitewall tires, which look quite elegant mounted on a set of wire wheels. The car has shaved door handles, trim, and the bumpers tucked in. The interior looks like something a high earning pimp would drive, with a white leather interior and polished chrome accents. No blue jeans will be worn in this car, unless one is sitting on a towel! 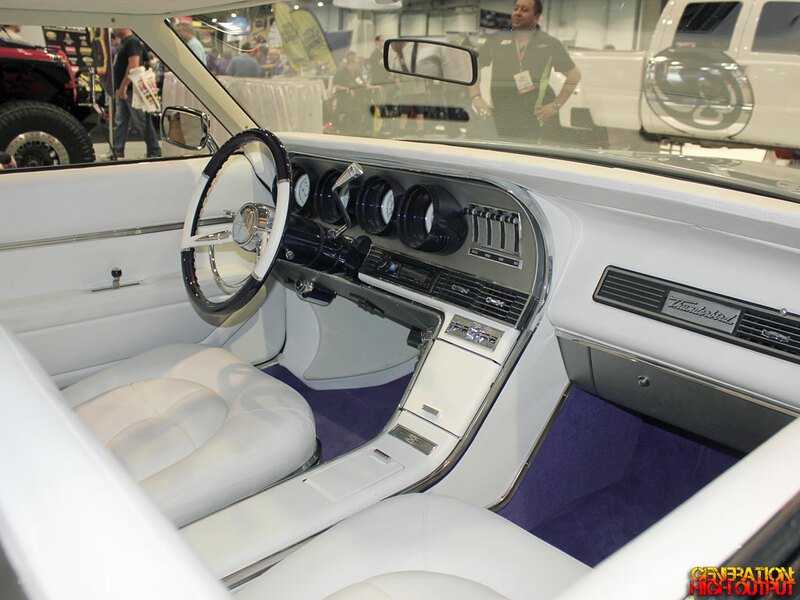 I couldn’t find much online about the car’s upgrades, but I did read that it has a Vintage Air system, Classic Instruments Gauges, a Painless Performance wiring harness, and a custom stereo by Al’s Creative Auto Sound. I’ve got to congratulate Eddie’s Rods and Customs on this amazing build, and for doing something original that really stands out from the crowd. We hope to see more great cars from them in the future! 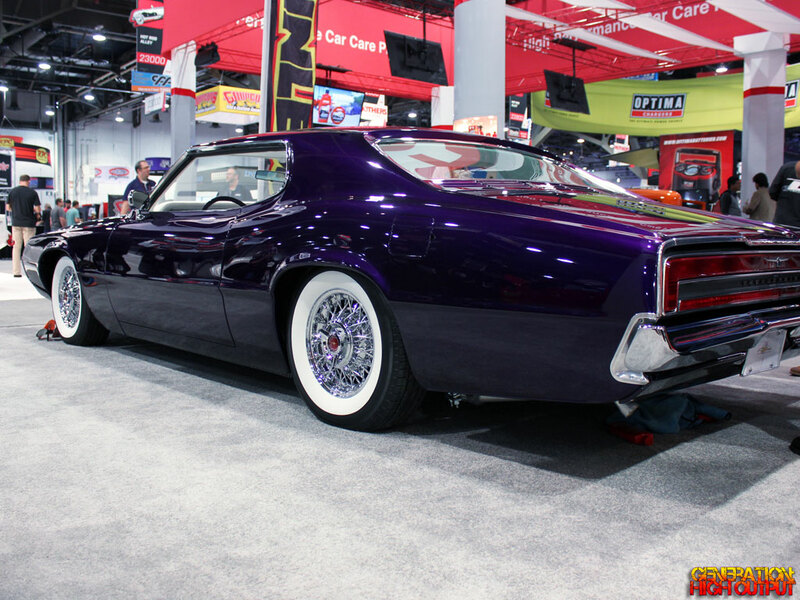 This entry was posted in SEMA and tagged Ford, Restomod, SEMA, SEMA 2015, Thunderbird, Thunderstruck by bryan lusk. Bookmark the permalink.